Holly still sits in Anna’s apartment trying to get her to love him as he loves her, but the cat Holly was playing with, Harry’s cat, has jumped the coop and our camera has tracked outside to follow. But outside, craning his face toward us, is a figure in a dark hat and coat who scuttles into the darkened doorway behind him when he sees the cat (or our camera?) tilting his way. For this brief moment, and a few others in the film, we know something that Holly does not. Here we see this mysterious figure watching Holly while he is too drunk and lovelorn to notice. Could this be the third man that carried Harry across the street? Some other spy in the employ of the Popescu-Kurtz-Winkel conspiracy? Could it be the same man who met with that coven on the bridge to organize the porter’s murder? Or perhaps some other kind of spy; one working for Calloway, or the Russians or the Americans? While a real spy, is big news and worth looking at in our analysis of the story, I would like to take today’s frame as an opportunity to look at something that has occupied the Viennese world since our leap into the fray. Today’s framing exemplifies it distinctly, and that is the distorted and bent view of the city that is presented here. The above examples draw attention to the fact that the lines in The Third Man do not create a graphic, two-dimensional aesthetic like that of a comic book drawn in black ink on white paper. Rather, they exist in three dimensions. The film’s diagonals are also orthogonals. This distortion is of course built into every frame of every film, since the medium attempts to represent three-dimensional space within the confines of the screen. The lens bends a visual span—one existing in a three-dimensional world—and compresses it onto a two-dimensional negative, literally taking the world and representing it in one less dimension, while maintaining the often overlooked dimension of time. Just as a two dimensional map can be extrapolated to real-world space through the use of keys, scales, and contours, so too can this filmic representation be extrapolated to represent a living and moving space across time. But also like maps, a flattening of what exists as a curved world creates distortions, enlarging, skewing and modifying the world to fit it into a two-dimensional schema. Through traditional cinematic tricks like strong diagonals, short depth of focus, and harsh contrast, The Third Man‘s 2-D image confidently represents this depth as a visual illusion. The glow emanating from the distant alleyway cues us to understand it as an existent space even without seeing it on the screen, and the darkened doorway toward the right side of the frame achieves the same illusion, just like the small bright blotch of a European face in front of that dark doorway shows us more of its textured scale. All depth in the film image falls subject to this type of illusory deceptions; even stereoscopic technologies which offer more convincing portrayals of dimensionality are utilizing technological and artistic tricks to represent depth. Renaissance artists developed a mathematical system of painting that allowed painters to portray three-dimensional space through a system of codes that mimicked the function of the eye. 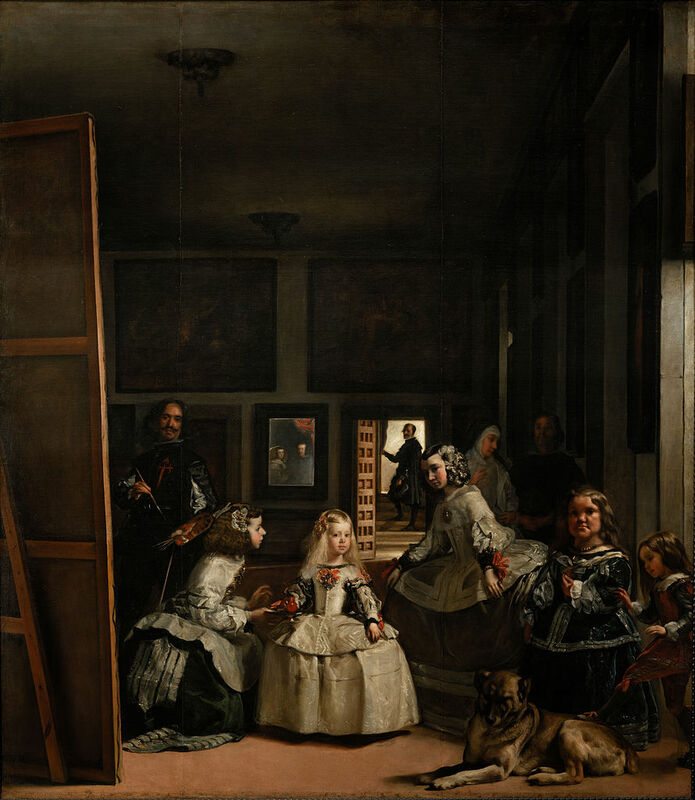 This painting, “Las Meninas” painted by Diego Velazquez in 1656 and retouched several times later, creates the illusion of a deep space through traditional rules of perspective and heavy contrast. The complex space extends in all directions, with the stairs leading beyond the back of the painting, and the mirror reflecting the king and queen whose perspectives we occupy. The re-assessment of the world from the perspective of the human (or street dog) rather than God made ripples throughout the world at the time. Certainly this serious reframing was connected to the Reformation, which refocused religion onto the individual’s relation to God, the Enlightenment, which rethought the world as something understandable by humanity rather than a miracle of God’s making, and the birth of Capitalism, which imagined the individual as the ultimate unit of satisfaction through the “pursuit of happiness” and accrual of worldly goods. Perspective may not be the match that lit off this powderkeg, and might be only a part of the enormous conceptual shift that precipitated all of these changes, but it is certainly tied to the massive rethinking of the world and universe. Two opticians and lens-makers of note played into this debate as well. Building off of the heliocentric theories of Copernicus, Galileo Galilei built the first effective telescope and defended the Copernican conception of the universe, which eventually led to him being found “vehemently suspect of heresy” and put under house arrest until his death. Baruch Spinoza was also a lens grinder and optician by trade, but is known for his philosophical work. Spinoza put forward the surprisingly atheistic conception that God is not a being but a substance which makes up everything, “Whatever is, is in God and nothing can be or be conceived without God” (Spinoza, Ethics, 1677, Part 1, Proposition 15). After this radical claim which invalidated much of the Torah’s claims on the actions of God-as-being, Jewish authorities issued a cherem, essentially excommunicating him from the Jewish faith. Of course, these two figures important in science and philosophy, also led their way specifically to the film we see today. The work of opticians and lens-grinders led eventually to photographic cameras, and then to the Lumiere Brothers’ moving picture designs. So we can trace the perspective built into today’s frame all the way back to the early Renaissance both stylistically and technologically, and we can claim a couple of 1600’s bad-boy thinkers as a part of our cinematic camp. One can only hope that Spinoza and Galileo, if alive today, would be filmmakers. But as far as perspective is concerned, today’s still continues to bend the rules. 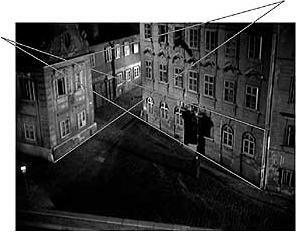 Operating beyond the traditional filmic styles of 1-point or 2-point perspective, today’s still operates on a three point grid, only comprehensible on a three-dimension axis. It is exactly this which throws the whole in The Third Man‘s bends and twists seems even more distorted than necessary. And even in a 3-point system, the fish-eyed distortions in the curves and twists of straight lines seem to shine through. If we take our astronomical metaphors even further, we can think of the Vienna streets (as they exist through the 104 minutes of screen time) as their own sort of space-time continuum. And, as we know from Einstein’s theory of general relativity, the path of light—and thus the visually perceived shape of objects—is bent in a gravitational field. As a beam of light, say the one bouncing off the corner of some Viennese building, passes by a massive body, it is deflected toward that body instead of in the straight line it would travel in a vacuum. This will create distorted perspectives, and in extreme cases, doubling, accounting for the many doppelgangers we’ve encountered in this city. Extremely massive objects can bend light to produce gravitational lensing, which presents multiple images of objects seen from the other side. 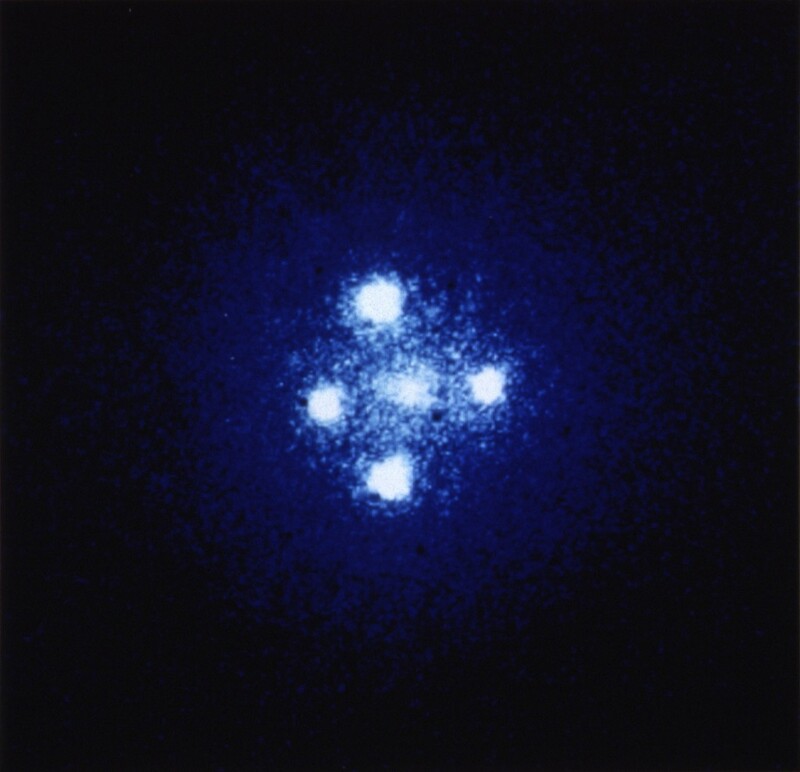 In the formation known as Einstein’s Cross, four images of the same distant quasar appear around a foreground galaxy due to strong gravitational lensing. So these twists and bends in the visual reality of The Third Man can be attributed distinctly, to some massive—if invisible—body occupying this Vienna. It could be the looming remnants of World War II, which we have already seen twisting and distorting the architecture of the city, but I prefer to think that this massive body is the massive figure of Harry Lime still lurking in some shadow of this ghost city. 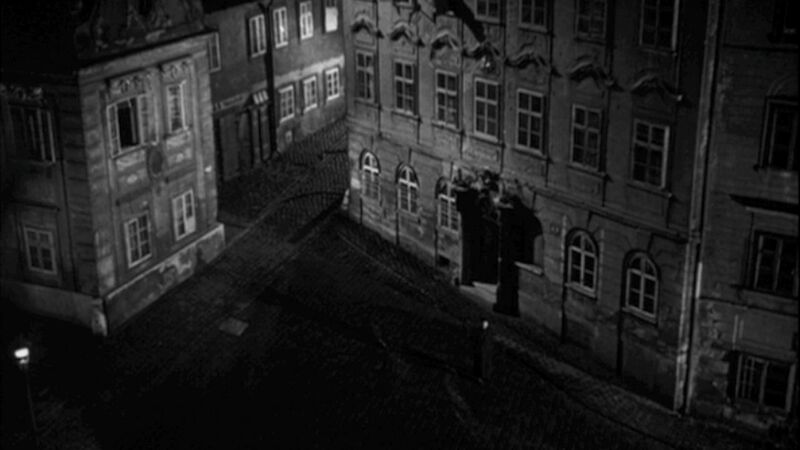 Whatever it is that distorts the world of The Third Man, it seems particularly apparent in this frame, and may even be localized to the darkened doorway and the barely-visible figure standing in front of it. This spy, stalking Holly or Anna, may be a personification of the massive dark-matter object bending and duplicating the streets of Vienna, and as we discover more about this figure soon, we will see why.